Los Altos Crema Centroamericana is a buttery and sturdy sour cream with delightful undertones of condensed milk. It�s silky in mouth feel and velvety in texture. Crema Centroamericana is ideal as a topping to pupusas and adds a luscious finish to soups, and sauces. 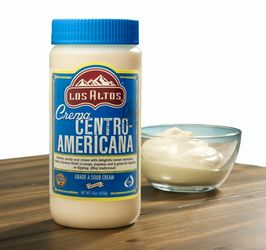 Los Altos Central American Cream is packed with the best refrigeration materials to keep them cold & fresh during shipping delivery process so they will arrive at your door step ready to eat, or further refrigeration or freezing (it may vary on some items). We only ship Los Altos Cream from Monday thru Wednesday so they don't travel during weekends. We are sorry but we cannot ship refrigerated orders to: APO, FPO, Etc, as well as Puerto Rico and Canada. All sales are final on this item and no returns are accepted. La crema de Leche estilo Centro America marca Los Altos es deliciosa hecha con leche entera de vaca. La Crema Centro Americana Los Altos las empacamos en MexGrocer.com con los materiales necesarios para que se conserven frias durante su traslado y lleguen a tu puerta listas para comer, refrigerar o congelar. Disfruta en tu casa o restaurante la calidad y sabor �nico de la aut�ntica crema centroamericana. The taste of El Salvador, right here in California! I feel like if I was back home in El Salvador when I use this crema. All of my family enjoys it on our traditional pupusas, but I also like it on corn on the cob, along with a bit of crumbled Cotija. It's rich and creamy and doesn't "water" down and drip off. It's nice and sour, Iove the flavor!